Yes, that's the reason Moses knew this Voice had spoke to him, was a Word Voice. He knowed that God had told Abraham, “Your seed shall sojourn for four hundred years, but I will deliver them.” And he knowed the four hundred years was up and he was called to do it. Man and women, God promised in this last days that He'd pour out His Spirit upon all flesh. He promised He'd send the Baptism of the Holy Ghost, and He'd call a Bride without spot or wrinkle. He promised to do it, He'll do it. Don't listen to these hireling shepherds, they'll lead you astray. The Holy Spirit is the Shepherd to feed you sheep food from this Word. It always comes by the Shepherd. He is our Shepherd. 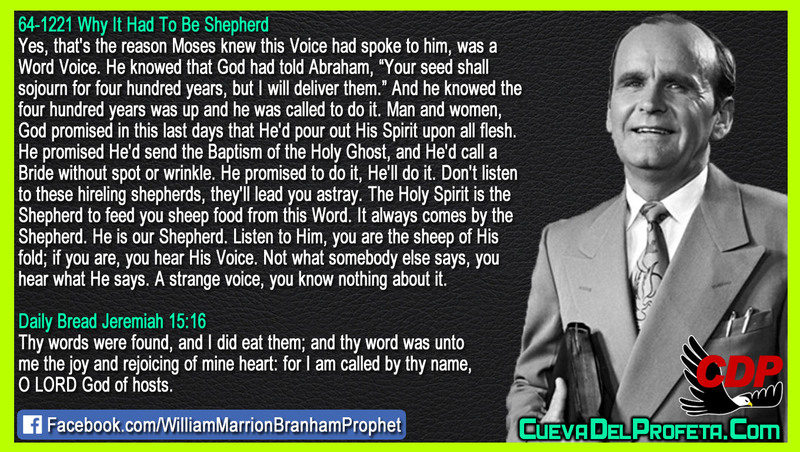 Listen to Him, you are the sheep of His fold; if you are, you hear His Voice. Not what somebody else says, you hear what He says. A strange voice, you know nothing about it.